Thassos is located in northern Aegean. It is the thirteenth largest island of Greece with an almost round shape, while being just 6 kilometers away form the coasts of Kavala. Thassos has many villages, both seaside and mountainous. The capital of the island is the Town of Thassos, also called Limenas, while Limenaria and Potos are major tourist resorts. Thassos is famous for its beaches, as they are many and beautiful with emerald water and nice sand. The island has rich vegetation and for this reason most beaches are located in amazing verdant landscapes. Thassos is a popular destination for summer holidays, especially for those staying in northern Greece, being located so close to the shores of Kavala. It is ideal for quiet family vacations, although there is some activity in Potos and Limenaria. Thassos has many stunning beaches with lovely sand and shallow turquoise sea. You will find some of the island's main beaches, clockwise starting from the north, in the list below. Agios Ioannis (Southwest Thassos): A relatively small beach in a sheltered bay with sand, green waters, sunbeds and umbrellas. Metallia (Southwest Thassos): A beautiful beach in a scenic landscape with the trees almost reaching the sea. Trypiti (Southwest Thassos): An impressive wide beach with white sand and deep blue sea. Atspas / Skala Marion (Southwest Thassos): A small picturesque organized beach with shallow water and lovely sand. Paradisos (Southeast Thassos): This is considered to be one of the top beaches of Thassos, with superb thin sand and shallow turquoise sea. Alykes (Southeast Thassos): A double beach of rare beauty as the strip of sand that penetrates the sea has water at both its sides. Psili Ammos (South Thassos): Although it is small, it is one of the most famous beaches of Thassos as it is organized with watersports. Potos (South Thassos): A large, organized and cosmopolitan beach, favored mostly by young people. Pefkari (South Thassos): An organized and rather large beach with sand, pebble and many large pine trees almost reaching the sea. Dasyllio Prinou (Northwest Thassos): A large stretch of sand with shallow clean sea and pine trees next to the sea. Makryammos (Northeast Thassos): A lovely, large and fully organized beach with shallow turquoise sea that is entirely covered by umbrellas. Vathy (Northeast Thassos): One of the best beaches of Thassos, quiet with green-blue sea and white sand. 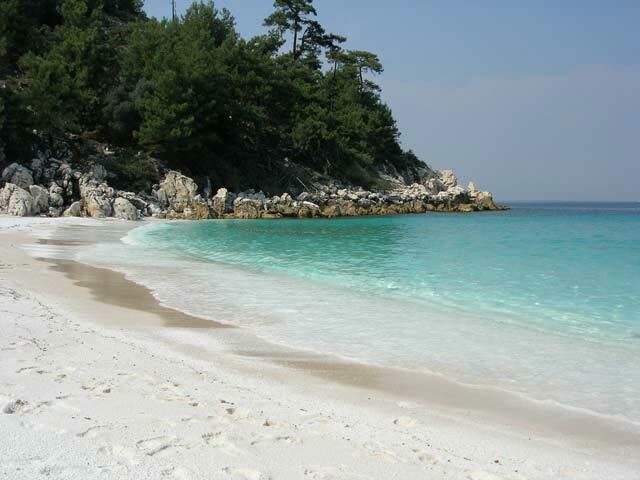 Saliara (Northeast Thassos): A beach of exotic beauty with thin white pebble and amazing turquoise sea. It is small in length but rather large, while the entire area is pine filled. Rahoni / Skala Rahoniou (North Thassos): A nice and quiet beach with thin sand and shallow crystal sea. Pahys (North Thassos): A rather long remarkable beach in a pine filled landscape with crystal waters. Glyfoneri (North Thassos): This very small beach with green water, covered with pine trees. Glykadi (North Thassos): A large organized beach with light sand and little pebble. Chrysi Ammoudia / Chrysi Akti (East Thassos): They are two beaches but it is in fact one, which is one of the largest and most popular on Thassos. It offers white sand and deep blue sea. Thassos is accessible only by ship throught the ports of Keramoti and of Kavala. The ferry from Keramoti will take you to Limenas of Thassos with the trip being less than one hour, while the ship from Kavala will take you to Prinos of Thassos in just more than one hour. Especially from Keramoti there are many ship routes for Thassos throughout the day. Thassos does not have an airport, but Kavala town does which is right across. There are local buses from the town of Thassos (Limenas) for most villages, but the bus schedule is not frequent. It is best having your own transport so you can explore all the remarkable beaches of the island and its scenic mountainous villages. Thassos has a decent road network that runs around the entire island in approximately 100 kilometers. Most accommodation is found on the northeast part of Thassos. If you want something quiet you can stay anywhere except from Limenas, Limenraria and Potos, as this is where the island's nightlife is centered. For cheaper vacations inside nature there are 3 organized campings on Thassos, one in Prinos, one on Chrysi Akti and one in Pefkari. Thassos is famous for its delicious local goat which you can find in all mountainous villages. Besides fresh fish and seafood you should try local delicacies like stuffed zucchini flowers, tatarika of Thassos (vegetable stew) and saragli (syrup sweet). Make sure you have some of the great local red whine with your meal. Thassos produces excellent pine honey and homemade spoon sweets. You can also buy olive oil and wine for which the island is famous. Its collection includes sculptures, ceramics and architectural remains from the Neolithic Age up to the Roman Age. On Thassos there are 3 folklore museums in total, one in Limenaria, one in Theologos and one in Kallirachi. The Agora is a very large green space where you can combine a stroll with a visit to the marble ruins. Visiting the Ancient Theatre of Thassos is a must, as it is in very good condition and it is in a location with a great sea view. Thassos has many scenic mountainous villages that you should not miss, for their rich vegetation as well as for the exceptional food in their taverns. One of the most popular attractions of Thassos. The monastery provides a spectacular view to the sea as it is literally hanging from the rocks. It is housed in a stone two-floor building and it is entirely devoted to the art works of the sculptor Polygnotos Vagis, born on Thassos. A new and modern museum where you can see a representation of olive oil production methods, various olive varieties, but also taste olives and olive oil. Gkiola is a natural saltwater pool which is formed by the seaside rocks. Near Kastro village, in a verdant landscape, you will find a small and gentle waterfall that flows into a small pond. Welcome to the Thassos page of Greece Vacation Search! Here you will find all the information you will need for your summer vacations on Thassos. Subscribe to our newsletter in order to receive news, offers and updates regarding the Thassos and all the other Greek islands.